At Nu Cosmetic Clinic, we offer a unique solution to your skin problems. All of our peels are tailor made to the individual’s needs, targeting your specific problems or problem areas. Over time our skin loses hydration which results in the loss of elasticity forming lines and wrinkles, and this is ever more noticeable when we reach middle age. Dermal fillers are an effective way of treating deeper lines and wrinkles. Many people suffer from the condition of excessive sweating ‘Hyperhidrosis’ and this can have a detrimental affect on people’s work and social life. The more common areas to be treated are arm pits, hands and feet. Thanks to technological advances, a lasting, convenient, quick and effective hair removal system has been developed known as Medical Photo-epilation. Now you can get rid of unwanted hair with IPL Lasers, a safe and long lasting solution. 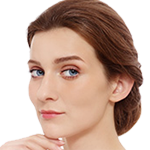 Vistabel® treatment is ideal for the temporary improvement of expression lines (particularly in the forehead and the eyelids) and wrinkles, such as crows feet and other facial wrinkle, and is used for correcting asymmetrical facial features.